MIT Media Labman came up with Art-o-Meter -- a system apparently equipped with motion detector that counts how much time people spend in front of an art piece. 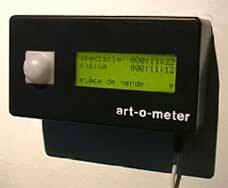 From the site: "Art-O-Meter is a device that measures the quality of an art piece. It bases its evaluation on the amount of time that people spend in front of an artwork compared to the total time of exhibition. The measurements are graphically represented by comments and a 5 star rating system." Not sure about the quality of art -- what if people are staring at something else? -- but are you thinking what I'm thinking? With this device, you can measure a lot of things about a store layout, from the windows to cash registers.